Engen will mark Youth Day with a mixture of humility and pride this year, as it honours the contribution of the youth in our history, while looking back proudly on many years of support for youthful causes in soccer, education and safety. “We’ve supported the Engen Maths & Science School [EMSS] for almost 30 years, supported the Engen Klevakidz paraffin safety campaign since 2008, and obviously we’re crazy about soccer, as our support for youth soccer has shown since 2003,” says Mntu Nduvane, Engen’s Corporate Social Investment Manager. The EMSS programme is Engen’s flagship CSI initiative. It is a long-running free extra tuition programme for high school learners who show potential in priority subjects but have been hamstrung by a lack of school resources or other challenges. The 397 matric learners that have come through Engen’s 2014 programme all had the benefit of financial support from Engen, including lunch, an EMSS ‘uniform’ and cash prize incentives for top performers. At three of the schools in the Eastern Cape, transport is provided to the learners by the Department of Transport. The Class of 2014 recorded a 99% pass rate, the highest in the programme’s history and almost 24% higher than the national senior certificate average. Another important statistic is that 70% of the 99% of learners who passed achieved a bachelor pass. The national average for a bachelor pass was 41%. As with many South Africans, soccer is a way of life for the country’s favourite petroleum brand. This fascination with our national sport is just as strong with youth soccer, as the company’s Youth Development Programme (YDP) proves. The Engen Knockout Challenge goes back 11 years. “We started in soccer to make a difference when there was no other corporate involvement. Today the Engen Knockout Challenge is one of South Africa’s most prestigious youth soccer tournaments,” says Brad Bergh, Engen Group Sponsorship Manager. During its 11 years, the competition has given numerous Under 17s across five regions the chance to show their mettle. Several Bafana Bafana players have come through it, including Thulani Serero, Ronwen Williams, Thuso Phala and George Maluleka, while a further 57 players who competed in the event are currently playing professional football. 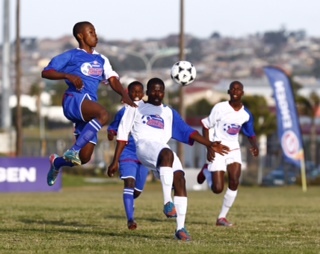 In 2014 Engen intensified its youth soccer participation by launching the Engen Champ of Champs. This sees the five winners from the Engen Knockout Challenge regionals, including the host club, compete in a 6-team tournament to be crowned national U17 champions. Engen’s Klevakidz campaign has taken the company’s paraffin safety messages to kids in rural and disadvantaged areas across the country since 2008, says Nduvane. To educate this group in the safe use and storage of paraffin, the Klevakidz campaign runs an annual interactive theatre roadshow to schools around the country. Other activities include displaying prominent paraffin safety signage on spaza shop walls in townships and informal settlements.